June 26, 2018 – Boston, Massachusetts – Joel F. Pierce will be retiring in June 2018 after more than four decades of practicing law, the last 20 at Pierce Davis & Perritano LLP, the firm he co-founded. 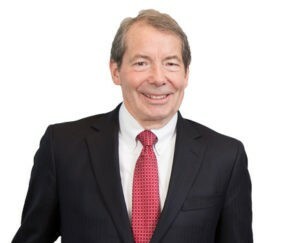 Joel began practicing law in 1976 with the Boston firm of Morrison, Mahoney & Miller, where he became a senior partner. In 1998, he joined John Davis, Judith Perritano, and the Honorable Elizabeth Fahey in founding Pierce, Davis, Fahey & Perritano LLP, now Pierce Davis & Perritano. Joel has extensive experience in litigating cases in both state and federal courts throughout New England. His experience includes all phases of discovery, through trial and appeals and spans a broad spectrum of product liability and toxic tort cases, including consumer and recreational products, industrial products, aviation and transportation, chemicals and other toxic substances. Recognized for his accomplishments by his peers and clients, Joel has received an AV rating from Martindale-Hubbell and has consistently been listed in Super Lawyers and Best Lawyers. The success of PDP can be directly attributed to Joel’s talent as an attorney and his character as an individual. His advocacy skills and dedication helped to build PDP and establish the firm’s product liability and toxic torts practice. Joel is also responsible for inspiring many individuals to join the legal profession and training new attorneys in the art of litigation. We wish Joel and his family all the best. At Pierce Davis & Perritano we embrace a simple philosophy – clients deserve more than just effort, they deserve results. Our approach allows us to better manage litigation activities and mitigate risks – regardless of the nature of the case. With more than 25 attorneys, we are able to aggressively defend clients in complex product liability, toxic tort, municipal liability and other specialty liability litigation. We bring to our clients decades of high-stakes trial experience, industry knowledge, and a commitment to the time-honored principle of client-focused service. That is why PDP remains the compelling choice for clients requiring clear direction in complex cases. Visit our website for more information www.piercedavis.com.